Welcome to the street rod and hot rod portion of the Wilwood Website. 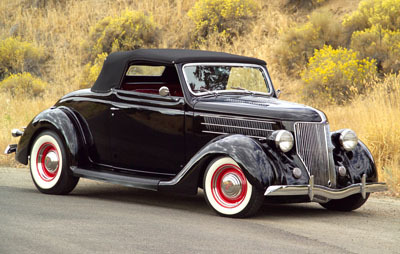 In this section we will cover street rods or what we refer to as pre-49 vehicles, also called hot rods or resto-rods. In 1949 Ford, General Motors and Chrysler automobiles made a big change in their body designs and in their mechanical attributes, so we will cover those cars in the Specialty Car section of this Website. Street rods and hot rods are generally considered to be cars built between the Model T years and 1948 for Fords and similar years for Chevy, Plymouth and Dodge products. Ford has always been the most popular car to turn into a hot rod or street rod so Wilwood has built brake kits that will fit Fords from the Model T to 1948. The following will give you a quick explanation of how that is done. 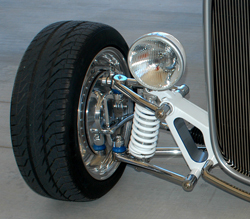 Many of the other makes and models can be equipped with Wilwood brakes and in many cases companies that specialize in individual marques such as Chevy, Plymouth and Willys have built kits that adapt Wilwood brakes to unique spindles. For more information on those vehicles call the technical experts at Wilwood. When a street rod or hot rod is going to be built with an I-beam or Tube-style Super Bell or Magnum axle, it will have to be upgraded with early Ford spindles (’37-’48). Early hot rod builders in the ‘50s used primarily the ’39-’48 Ford spindle because they wanted to upgrade the early Fords with superior hydraulic brakes. In most cases they used the spindle and the entire brake system. Henry Ford didn’t like to change things if he didn’t have to, so ‘38 and older Fords were still equipped with outdated mechanical brakes. All of the other marques changed to hydraulic brakes years, and in some cases decades earlier. Edsel Ford finally talked his dad Henry into changing to hydraulic brakes in 1939, primarily because as early as 1936 Chevy was selling more cars than Ford due to their more contemporary engineering. On a positive note, because Ford didn’t change things unless he had to, the ’39-’48 spindles were a direct fit on Model A through ’38 Ford axles. Model T Fords that were turned into street rods were generally upgraded with Model A or ‘32 Ford front axles with the later spindles, so the Wilwood disc brakes can be used on the very early Model T Fords when the correct axle upgrade is made. It is still possible to find early Ford spindles in swap meets, but because they are scarce, there are aftermarket companies producing new spindles using the old design. It is interesting to note that some builders that were working on early Chevys, Plymouths and Dodges would change the front chassis crossmember to one from a Model A Ford and they would equip the cars with dropped Ford axles and early Ford spindles. In the early days it was the only way to get the dual parallel leaf spring cars to sit nice and low. Today most hot rod builders with Chevys, Plymouths, Dodges, Willys and other more obscure marques equip the cars with aftermarket independent front suspension systems. If you purchased a car years ago or recently and want to upgrade the brakes make sure the car has early Ford spindles or a Mustang II based independent front suspension system, because Wilwood makes a kit that will bolt right on. Wilwood does make several disc brake kits that can be used on ‘37-‘48 Ford spindles starting with the very popular and widely used Forged Dynalite Pro Front Kit featuring Forged Dynalite four-piston calipers and 11.00-inch or 11.75-inch rotors in the buyer’s choice of standard or drilled and slotted styles. 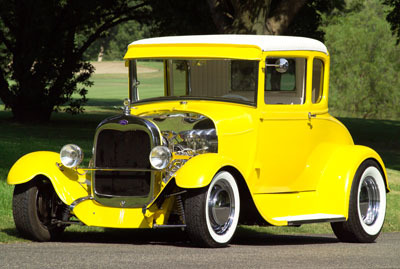 If you go to a car show and look at a Model A or ‘32 Ford running a dropped and chrome-plated I-beam, Super Bell or Magnum axle with early Ford spindles it will usually be equipped with a Wilwood Forged Dynalite kit that is often upgraded with polished calipers, polished hub assemblies and a pair of 360-degree caliper brackets that were detailed to the owner’s desired finish. The 360 degree caliper brackets are furnished in a machine finish so the owner can have them polished, chrome-plated or powder coated to accent the color of the car. The Dynalite kit can also be ordered with the standard caliper brackets and they too can be detailed in several ways to give the car a distinctive appearance. In standard form the Forged Dynalite Pro Front Kit comes with the owner’s choice of black or red calipers, machine finish hubs and with standard or drilled and slotted rotors, so the basic brakes are very attractive. If you have a black or red car the black or red calipers can definitely look cool too. Some special-order caliper colors are also available so check with your Wilwood dealer to see what other colors are available. If you look under that street rod you may also find a Wilwood dual master cylinder feeding fluid to the calipers and a hand crafted brake line setup outfitted with Wilwood residual valves and a Wilwood proportioning valve. This entire Wilwood system not only looks terrific it will provide that street rod with stopping power that is better than the stopping power of most new cars being offered today. The same kit minus the 360-degree caliper bracket is also available for independent front suspension systems using Mustang II style spindles. Most of the suspension manufacturers use this kit as their upgraded suspension system and they prefer the polished calipers and standard rotors for a clean smooth appearance, but if you make a request, they can outfit the suspension kit with slotted or drilled and slotted rotors. which would be perfect for the later cars that are not running chrome-plated undercarriages. In standard form the brake kit comes with black or red calipers, machine finish hub assemblies and with the buyer’s choice of standard or drilled and slotted rotors. 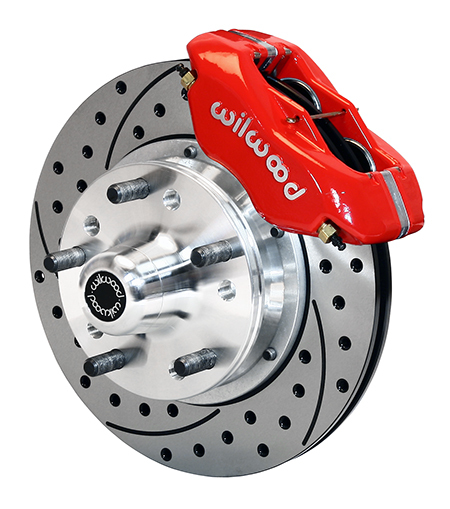 Some special caliper color selections may be offered so check with your Wilwood dealer for more information. This Dynalite Big Brake Front Hub Kit is also available for street rods running aftermarket independent front suspension systems based on the Mustang II spindles. If you are going to purchase a kit from a dealer that offers Wilwood brakes as an option, you can ask them to upgrade the kit with this larger brake system. The Mustang II kit can also be detailed for an ultimate show car with polished calipers and hub assemblies, or it can be ordered as a base kit so talk to your front suspension supplier. Again the Big Brake Kit can be supplied with the Wilwood dual master cylinder and it’s always important to use the recommended residual valves and a proportioning valve to keep the pedal high and the brake bias correct. Some street rod builders want the ultimate brakes under the street rods they are building and would like six-piston brakes. Superior stopping power and optical appeal can be obtained by using the Dynapro 6 Big Brake Front Hub Kit that features six-piston Dynapro calipers and 12.19-inch rotors. This kit can also be ordered with polished calipers and hub assemblies or in the standard form with black or red calipers and a machine finish hub assembly. This brake can be used on the early Ford and the Mustang II spindles and it can be ordered with the buyer’s choice of standard or drilled and slotted 12.19-inch rotors. If you are ordering a new front suspension system from an aftermarket supplier, specify that you want a Dynapro 6 Big Brake Front Hub kit. The largest and most powerful front brake kit available for independent front suspension equipped street rods with Mustang II spindles is the SL6 Big Brake Front Hub Kit. This kit features the large SL6 caliper used in conjunction with 12.88 and 14.00-inch rotors. Similar to the previous kits we have covered, this brake system can be ordered with a polished caliper and hub assembly or in the standard version with a machine finish hub assembly and a red or black caliper. Some other caliper colors can be special ordered so ask your Wilwood dealer. The brake system can be ordered with the large rotor sizes in slotted or drilled and slotted styles. This brake kit is great for large heavy street rods and it’s only suitable for cars running 17-inch or larger custom wheels. There is also a lightweight drag race brake system available for cars using the early Ford spindle. The Forged Dynalite Front Drag Kit features a Forged Dynalite caliper and a lightweight drilled solid rotor in a 10.75-inch diameter. This brake kit is designed for cars weighing 2400 pounds and lighter and it is an excellent choice for a T-bucket front suspension. If you are running an independent front suspension there are two drag race applications you can adapt to a street rod and they are the Dynapro Single Front Drag Kit that features a small single piston caliper and a lightweight drilled solid 10-inch diameter rotor. This kit can be used on street rods weighing 1,800 pounds or lighter. The other kit that can be used is the Forged Dynalite Front Drag Kit that features a Forged Dynalite caliper and a lightweight drilled 10.75-inch solid rotor or a drilled rotor. This kit should only be used on street rods weighing 2,400 pounds or less. Wilwood would also like to tell you that if you equipped your street rod with a GM caliper kit from an early or contemporary supplier you could upgrade it with Wilwood’s new D52 caliper that is a direct bolt-in replacement for the GM caliper. The D52 uses the same caliper bracket and if your are handy with tools and understand disc brake systems, the upgrade can be done in less than an hour and all you need is basic hand tools. The GM caliper uses a large single piston and the D52 uses two large stainless steel pistons, so if affords superior clamping force and equal pressure on the brake pad. The D52 caliper is also constructed from forged aluminum so it is much lighter than the original caliper. The D52 caliper is available with a black or red finish so it is attractive and you don’t have to worry about rusting like you would with the GM caliper. 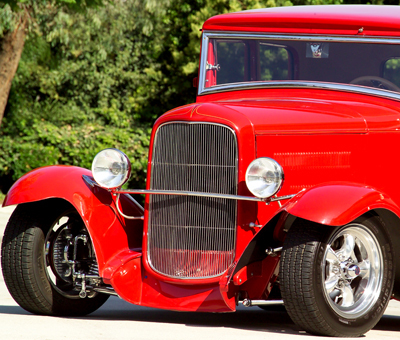 Street rod rear suspensions can also be upgraded to Wilwood brakes and the most common application used in street rods is the Ford 9-inch differential. The Ford 9-inch differential is used in a wide range of cars so there are several different brake systems that can be used for street rods. The big Ford is the most commonly used differential but it is not the only one you will find. The small 8-inch Ford differential is also popular with street rod builders who are not using extremely high horsepower engines. Some of the enthusiasts building Chevy street rods like to stick to all Chevy products so they install Chevy 10 and 12-bolt differentials in their cars. The fellows building Plymouth and Dodge street rods will use Chrysler 8 ¾ differentials in their cars. Fortunately Wilwood offers rear brake kits for all of the differentials we mentioned so we will look at what is available. Since the Ford 9-inch is the most popular rear differential for street rod use, and the 8-inch can share brake kits with the big brother we will look at those first. The Forged Dynalite Pro Rear Kit features Forged Dynalite four-piston calipers and 12.19-inch diameter rotors in the buyer’s choice of standard or drilled and slotted styles. The kit is available with red or black calipers and polished versions are optionally available. This rear kit is designed for applications where individual wheel parking brake assemblies are not required. If you require a parking brake, the Forged Dynalite Rear P-Brake Kit features Forged Dynalite calipers and 11.00 or 12.19-inch rotors in standard or drilled and slotted styles, and the kit uses an internal drum parking brake mechanism. This kit can be ordered with red or black calipers and a polished version is optionally available. 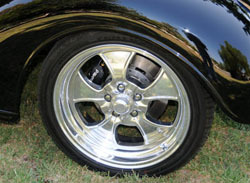 The Combination Parking Brake Rear Kit can also be used on street rods and it features a Combination Hydro-mechanical Parking Brake caliper and 11-inch rotors in the buyer’s choice of standard or drilled and slotted styles. This caliper uses hydraulic pressure from the master cylinder for stopping power and an internal mechanical lock for the parking brake. The caliper is available with a red or black finish and a polished version is optionally available. The SL4 Big Brake Rear Parking Brake Kit can also be used and it features large Billet Narrow Superlite 4 calipers with 12.88 and 14.00-inch rotors in slotted or drilled and slotted styles, with an internal drum parking brake system. If you are building a drag race car you can use the Forged Dynalite Rear Drag Kit that features Forged Dynalite calipers and drilled steel 3/8-inch plate steel rotors. The final drag race kit is the Forged Dynalite Dynamic Rear Drag Kit. The dynamic mounting uses floating T-nuts to isolate the different thermal expansion rates between the steel rotor plate and the aluminum rotor hat. It features Forged Dynalite four-piston calipers and dynamic rotor mounting using 11.44-inch rotors. Chevy enthusiasts who equipped their street rod with a 10 or 12-bolt differential have the following rear brake choices. The Chevy differentials can be ordered with the Forged Dynalite Pro Rear Kit that features Forged Dynalite four-piston calipers and 12.19-inch rotors in the buyer’s choice of standard or drilled and slotted styles. This rear kit is designed for applications where individual wheel parking brake assemblies are not required. The Chevy differentials can also be used with the Forged Dynalite Rear P-Brake Kit. This kit offers an internal drum parking brake and comes with 11.00 or 12.19-inch rotors in standard or drilled and slotted styles. This kit comes standard with a black or red caliper, but a polished version is available. The Chevy differentials are also available with the SL4 Big Brake Rear Parking Brake Kit and it features red or black calipers and large 12.88-inch rotors in the buyer’s choice of slotted or drilled and slotted styles. This brake uses an internal drum parking brake assembly. The Chrysler 8 ¾-inch differential is similar to the Ford differential but it has a slightly smaller ring and pinion gear. This is a very strong differential that can be used with high horsepower engines and several brake kits are available. The Chrysler differential can be equipped with a Forged Dynalite Pro Rear Kit that features Dynalite calipers in red, black or polished finish. This brake features 12.19-inch rotors in the buyer’s choice of standard, or drilled and slotted styles. This rear brake is designed for applications where individual rear parking brake assemblies are not required. The 8 ¾-inch Chrysler differential can also be used with the Forged Dynalite Rear P-Brake Kit. This kit features Dynalite calipers in red, black or polished finish and is used with 11.00 or 12.19-inch rotors in the buyer’s choice of standard or drilled and slotted styles. This kit features an internal drum parking brake system and is the most popular rear kit for street rods. The Chrysler differential can also be equipped with the SL4 Big Brake Rear Parking Brake Kit that features red or black calipers and large 12.88-inch rotors in the buyer’s choice of slotted or drilled and slotted styles. 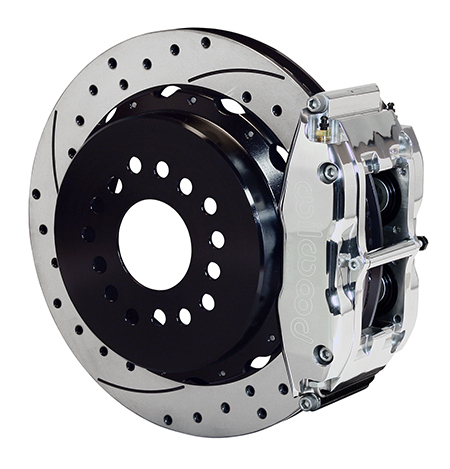 This system features an internal drum parking brake mechanism and the brake is perfect for large, heavy street rods. Wilwood also offers the Forged Dynalite Rear Drag Kit. This kit features Forged Dynalite calipers in black or polished finish and 11.44 inch drilled 3/8-inch plate steel rotors. Some street rods are also built with independent rear suspension systems and several companies offer Wilwood brake installation kits for the Jaguar suspension. Jaguar rear suspension systems are being used in street rods even though they are getting more difficult to find. The original Jaguar disc brakes aren’t the greatest looking or operating units so most rod builders equip the differentials with Wilwood disc brakes. 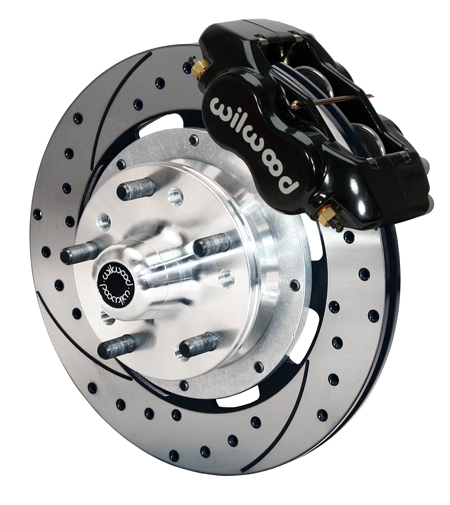 Wilwood doesn’t offer a disc brake conversion kit for a Jaguar but they are available from companies that specialize in Jaguar parts and service. Call our Sales Department for referrals. The kits are designed for the polished Dynalite calipers and they use the Wilwood Mechanical Spot Caliper for a parking brake. The other companies that manufacture aftermarket independent rear suspension systems are using Wilwood calipers on their products. We have covered all of the brake applications we have for street rods but if you didn’t find what you were looking for or if you have questions please contact Wilwood’s tech line for assistance at (805) 388-1188 or email Sales/Tech Support. Installs: Model A Brakes Stopping an Early Ford More Install How-To's . . .